I've eaten many versions of the classic pasta dish 'Carbonara'. Given how few ingredients it takes to make the sauce it's amazing how different they have each been. 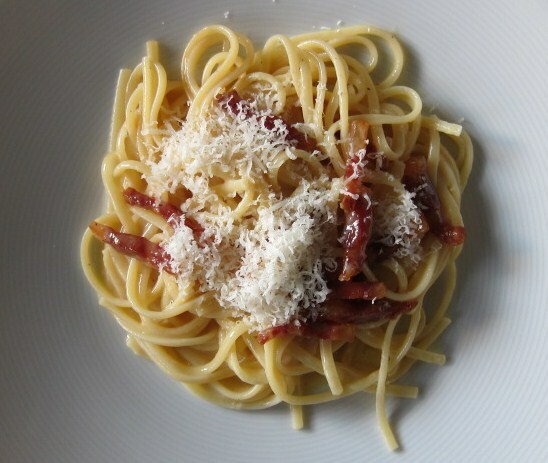 Although carbonara is regarded as a classic, there's no recorded recipe before the 1940's. Certainly there's no mention of it in Pellegrino Artusi's opus La scienza in cucina e l'arte di mangiare bene published in 1891, nor in Ada Boni's La Cucina Romana published in 1927, so it's a relative newcomer in pasta sauces. The name is generally attributed to the charcoal workers in the Lazio region of Italy - Carbonari - so it's mostly found in and around Rome. This recipe is based on Jacob Kenedy's which is in his book The Geometry of Pasta. The recipe caught my attention because it calls for guanciale, cured pig's cheek, rather than pancetta. Having recently found a source of this hard to find cured pork, I wanted to make the most of it. Guanciale has a lovely piggy flavour and a particular fattiness which emulsifies beautifully with the other ingredients the recipe calls for. Carbonara is a rich sauce so you may as well go the whole hog, so to speak. This is not a dish for the calorie conscious, or as Kenedy puts it, it's " ... almost a heart attack on a plate" but it is "surely a good way to go ..."
Obviously the shape of dried pasta chosen makes a difference too. Opinion is divided as to which is best. Personally, I like to use spaghetti or linguine. Jacob Kenedy prefers bucatini. I've adjusted the quantities to suit the appetite of my family and, because I don't like pasta with too much sauce, but essentially this is Kenedy's recipe and method. For me, it's the best - so far. While you cook the dried pasta, fry the guanciale in the olive oil over a high heat until the fat blisters and browns but is still soft (being fatty, it will smoke). Take the pan off the heat. In a large bowl, beat the eggs with the cheese and add the pepper. Warm the bowl just a little over the boiling pasta water. Once cooked, drain the pasta and add to the guanciale, tossing to coat it in the fat. Pour into the the bowl and stir well for a minute to partially thicken the egg. Check the seasoning and serve with extra cheese on top.